Hirokazu KANAZAWA was born in 1931. He is the last student of Gichin FUNAKOSHI, 10th dan of Shotokan karate and essential figure of Japanese martial arts in general. 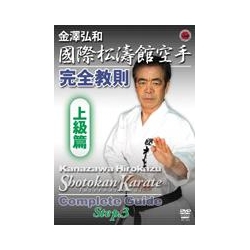 Master KANAZAWA is the founder of the KOKUSAI SHOTOKAN Federation and is considered to be the greatest Shotokan-style Karateka after Master FUNAKOSHI, who popularized karate and spread the art of empty hand around the world.